Concert has not been played yet. Hell & Heaven Metal Fest, Recinto Ferial - Feria de Texcoco. This festival was cancelled by Mexican authorities. According to the same source that told us about a South American tour in 2014 the band would play 2-3 new songs in 2014, too. Who believe there will be any new, original songs played at this show? @Soulmonster wrote: Who believe there will be any new, original songs played at this show? MEXICO CITY — A Mexican state's decision to cancel a two-day heavy metal concert with top bands like Kiss, Twisted Sister and Guns 'N Roses is drawing fire from fans and organizers, who say they suspect that political motives, corruption or discrimination are behind the move. 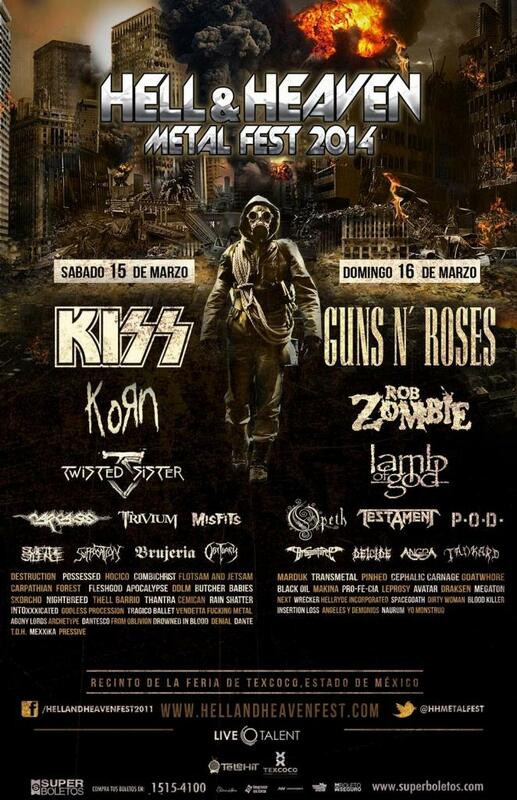 The Mexico state government says the March 15-16 "Hell and Heaven Metal Fest" concert planned for a fairground just east of Mexico City did not have adequate safety plans, posing a risk to concert-goers. The web pages of all three of the metal bands still showed the concert on their tour schedules. The state sent about 300 riot police to surround the fairgrounds Friday in the township of Texcoco. The state civil defense office, and its federal counterpart, said in a statement that it had cancelled the organizers' plans "for 70,000 to 80,000 people and 50 musical groups, because safety conditions for potential concert-goers were not ensured." It cited a lack of fire safety and evacuation plans, and inadequate planning for fireworks. But concert organizers noted that the same fairgrounds are used each year for the Texcoco International Horse Fair, which is essentially a big concert drawing crowds nearly as large, with groups that perform songs directly related to violence, like narco corridos, which celebrate the exploits of drug cartel leaders. For decades in the 1960s, 1970s and early 1980s, the Mexican government effectively blocked most outdoor rock concerts, apparently fearful of gatherings of rebellious youth. But in Mexico, it is drug cartel violence that has cost tens of thousands of lives in recent years. The town of Texcoco is governed by the leftist Citizens' Movement party and still supports the Metal Fest. Town spokesman Francisco Vazquez said he believes the state government, which is in the hands of the ruling Institutional Revolutionary Party, may have cancelled the concert for political reasons. "I can't rule that out," said Vazquez. "This is discrimination against Texcoco." But lingering suspicion of heavy metal in socially conservative Mexico may have played a role. Texcoco market vendor Juan Portugues told the Milenio television network that local residents were leery of the festival. "We think that this event, this metal event, will be attended by a certain type of people, gangs will come." Juan Carlos Guerrero, the spokesman for the concert organizers, said "I don't know if this is discrimination against the metal community, I couldn't prove that's the case, but there are some things that make you wonder, and one is that massive 'grupero' (another northern Mexico genre) concerts have been held in Texcoco, with as many as 200,000 people." Another of the concert's organizers, Javier Castaneda, vowed the show would go on. "This is not a question of discrimination against heavy metal, it is more about political and financial interests," said Castaneda. Yes, I am mighty confused. That's why I haven't closed this thread yet. It seems like it is still very possible the show will happen. That was exactly what I was hoping for!